Of course, Aunt Sadie met me at the front door wiping her hands on her apron and led me through the house to the back porch where Uncle Sid was looking at the mail while enjoying the warmth of the morning sun. 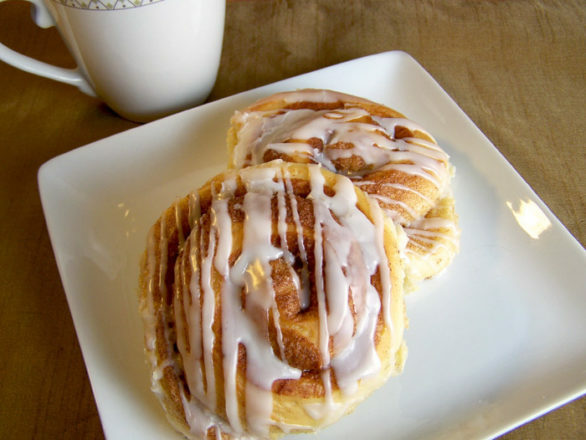 There, sitting on a white painted round table, was a plate of freshly baked cinnamon rolls and a pitcher of ice-cold milk. Her cinnamon rolls are the real things, too! Uncle Sid wouldn’t allow any of those canned types to be placed on the table at their house. He has complained for years about canned baked goods causing marriage problems in the home. Uncle Sid puts a lot of stock and value in good homemade cooking. After exchanging pleasantries and taking my seat in a lime green metal chair near the table to share with Uncle Sid some of Aunt Sadie’s cinnamon rolls, Aunt Sadie asked me how things were going. It had been a pretty demanding week and I sort of complained about how hard I had been working lately. I even made the statement of not having enough time to get things done the way I really wanted them to be completed and how hot it has been lately. “Well maybe you can handle some of those government problems like I did the other night dealing with my neighbor,” the old farmer said, leaning back in his chair. “It had been a hot one, and we received a phone call in the morning from Beedie down the road. I had spent the night turning my pillow on a regular basis just to find the cool side to rest my head on,” Uncle Sid went on to say as Aunt Sadie grinned. Their old house didn’t have air conditioning, and the only way they had to move the hot and humid air around the house was with a GE oscillating fan. He had said he even moved down to the foot of the bed to get some air from the open window. Uncle Sid took another bite of cinnamon roll and progressed with the story. “He was telling me my dog had barked all night, and he wanted me to make him stop!” the old man said with a grin. Yeah, it is best Uncle Sid continues on the farm and stays out of politics.